Since 1976, Star Paving and Sealing Co. has been providing high-quality asphalt and paving services to residential, commercial and industrial customers, always marked by a job well done. From excavation, to paving, to sealcoating and repairing, we do it all at any scale. Turn to us for asphalt excellence! Get a free estimate on your project today. For asphalt work in a class all its own, there’s no better option for paving, repairs and maintenance than Star Paving and Sealing Co.! We’re widely regarded for our abilities when it comes to asphalt paving in Memphis, TN and enjoy a reputation for excellence that’s more than 40 years in the making. And, we continue to establish this reputation on every job we do, from general asphalt paving, repairs and maintenance, sealcoating, tarring and chipping and much more. It’s why commercial, municipal, industrial and residential customers alike turn to us when they need asphalt work done. At Star Paving and Sealing Co., we take every aspect of the job seriously. Turn to us for careful excavation work, keen attention to detail during the paving process and careful consideration when it comes to repairs and sealcoating in Memphis, TN. We even take the time to clean up, leaving the worksite better than when we found it. With the owner on-site for every job, you can also rest assured there’s accountability and communication: two essential keys for a job well done. If you’re approaching an asphalt project and want to make sure the work you’re getting meets and exceeds your expectations, have confidence in choosing Star Paving and Sealing Co.
Our focus is always on a quality job well done. This also extends to our jobsites—we leave them cleaner than when we found them! We’re a second-generation, family-owned and -operated paving company with experience that stretches back over more than 45 years. Though we focus primarily on large-scale commercial and municipal work, we also provide driveway paving and similar services to residential customers. More than paving, we provide repair and maintenance services that include sealcoating, crack filling and more. Turn to us for free estimates and consultations. We’ll get you a fair and honest quote, then strive to stay on-time and within-budget on that quote. 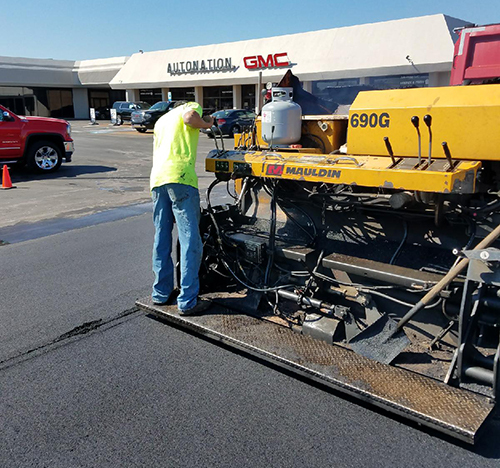 From tar and chip driveways, to sealcoating for commercial parking lots, to municipal paving, count on our team for quality results you can see. Contact us for a free consultation today.